This was another of Anne's recommendations to us on our episode of What Should I Read Next! In My Kitchen Year, Reichl chronicles her experiences in the year following the demise of Gourmet magazine, of which she was the editor. This cookbook/memoir is a good mix of accessible and aspirational; she makes you want to pay attention to and connect more fully with food in your everyday life without being intimidating. 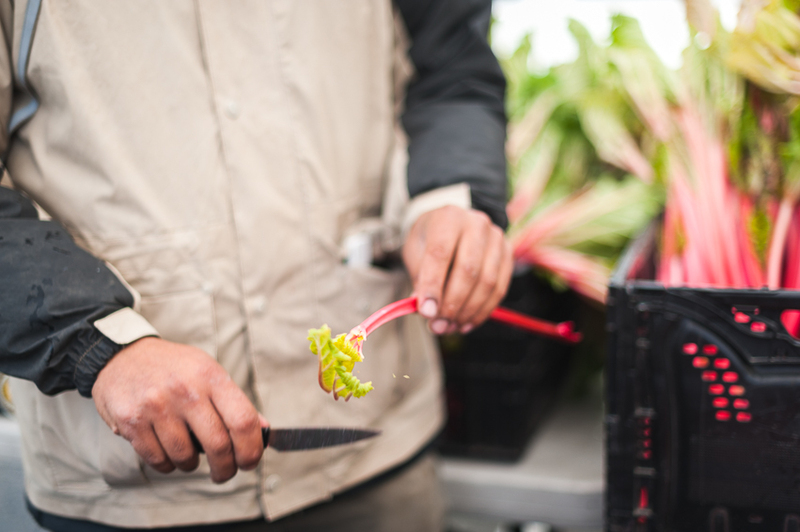 There's also a strong focus on seasons, farmer's markets, and using seasonal produce to produce phenomenal food. 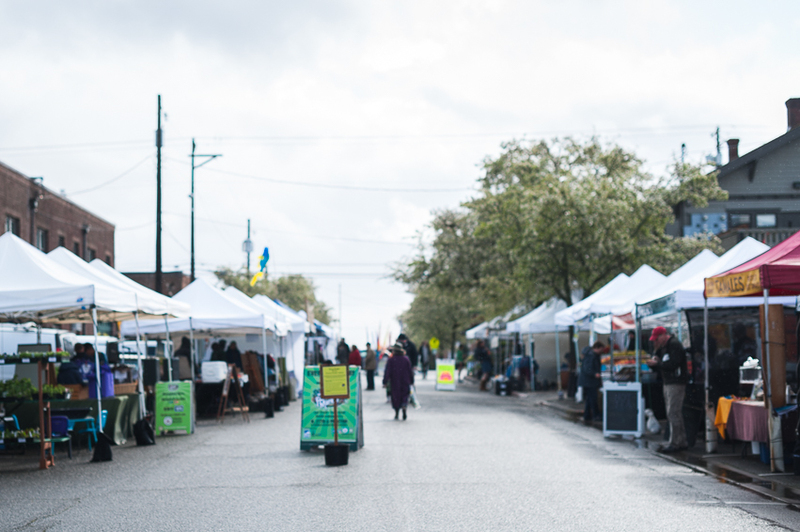 Soooooo of course the first place we went was our local farmer's market! We make a habit of having a kid-free morning together on the weekends while our husbands are home, so we met up early at a coffee shop around the corner from the market to get some caffeine, breakfast, and quiet time to pour over the book. An hour later we had some solid inspiration for what we might make for our dinner, and the market was officially open. The rhubarb was too beautiful to pass up! Reichl's recipe for compote looked easy enough and would be the perfect sweet-tart topping for fresh vanilla ice cream, so of course we picked up a pound of it. The next day it was time to put our produce into action and pull off a seasonal spring dinner for our families. In typical PNW fashion, the weather careened wildly between misty rain and brilliant sunshine, and though we were hoping for a warm, rich golden hour, what we actually got was a mild, but cloudy evening. Reichl talks a lot about adding simple touches to elevate a meal's setting, and of staying true to your own style and not making anything stressful. 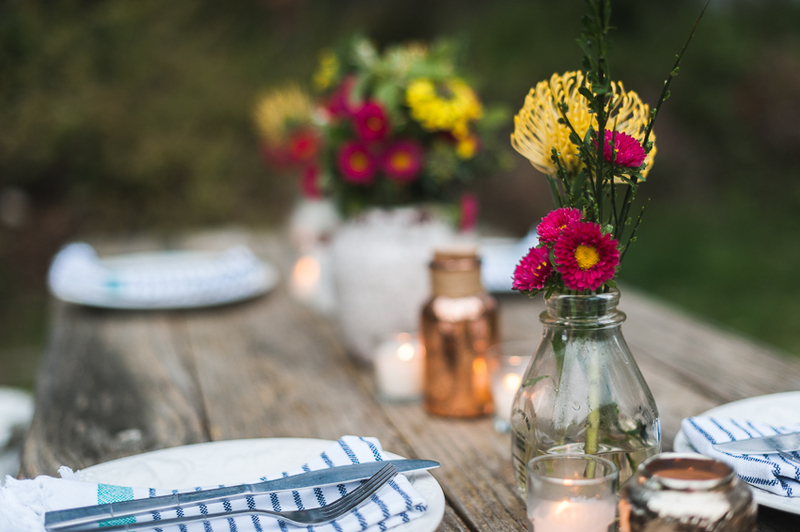 Taking her advice, we simply pulled Rikki's picnic table over to her garden, and topped it with some basic flower arrangements and candles I had on hand. The milk bottle vases are from a local farm and previously contained half-and-half, while the addition of a few rose gold accents created a cohesive feel. A basket of fresh produce, simple dinner plates, some striped napkins, and a few blankets dropped on the benches to add some cozy finished everything off. What's a spring meal without some fresh drinks? 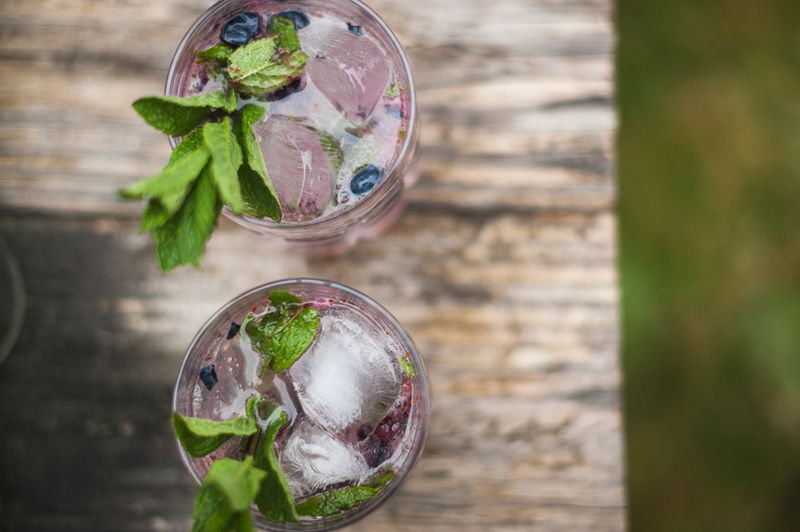 We muddled fresh mint and blueberries in a cocktail glass then topped it with vodka and sparkling lemonade to cheers the changing of the season. Easy, effective, and wonderfully refreshing to sip on while we prepped food and chatted about the book. 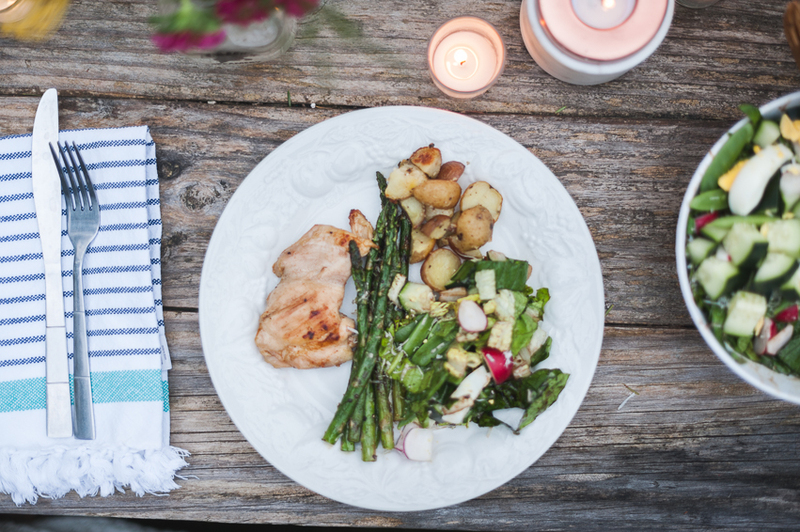 We used recipes directly from the book and kept things simple: grilled chicken dunked in vinaigrette, roasted potatoes, perfectly al dente asparagus, and a salad topped with hard boiled eggs from Rikki's chickens. Everything went into serving bowls and found it's way out onto the table. 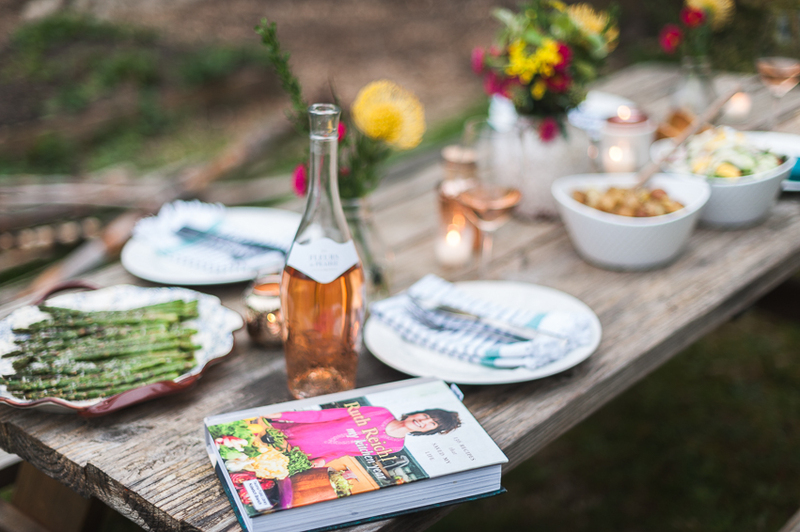 We popped open the prettiest bottle of rosé, passed the food around, and set the kids up next to us on a picnic blanket while they giggled and played games amongst themselves. 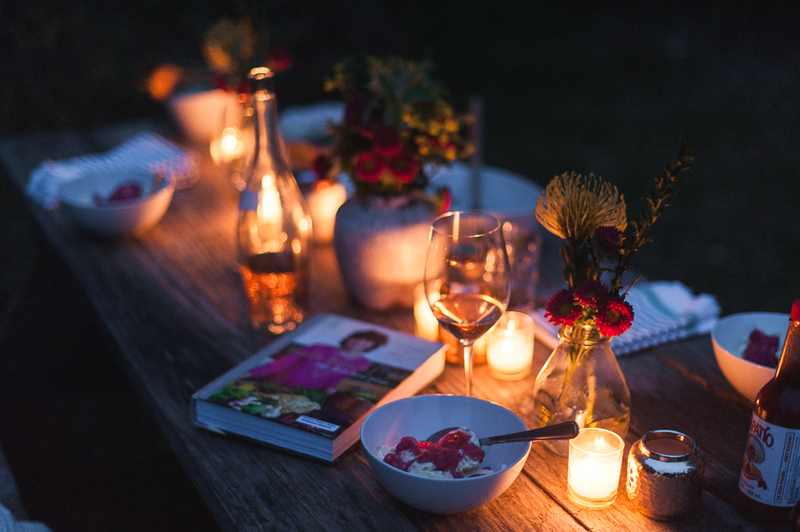 The adults gathered at the table and settled in to enjoy the meal, pulling blankets onto laps as the evening cooled and darkened, while the conversation never slowed. As expected, the rhubarb was indeed the perfect tangy, not-too-sweet topping for the rich sweetness of vanilla ice cream (thanks, Ruth!). Even the kids devoured it, to our surprise! By the time the candles were guttering out, it was bedtime for our little ones, and we reluctantly cleared up and parted ways. A definite success for our first outdoor meal of the season! Thank you Anne, for this phenomenal recommendation, we thoroughly enjoyed it!